Gamma-rays are the highest-energy form of light in the universe. Some are generated by transient events, such as solar flares and the huge star explosions known as supernovas. Others are produced by steady sources like the supermassive black holes at the hearts of galaxies. At the heart of an expanding gas cloud lies what's left of the original star's core, a super-dense neutron star (also called a pulsar) that spins 30 times per second. 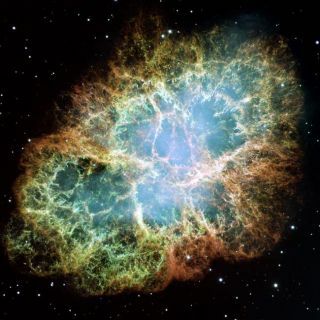 Until recently, all of the Crab's high-energy emissions were thought to be the result of physical processes near the pulsar that tapped into this rapid spin. For decades, most astronomers regarded the Crab Nebula as a super-steady beacon at X-ray energies. But data from several orbiting instruments — including Fermi's Gamma-ray Burst Monitor — now show unexpected variations. Astronomers have demonstrated that since 2008, the nebula has faded by 7 percent at high energies, a reduction likely tied to the environment around its central neutron star. Since 2007, Fermi and the Italian Space Agency's AGILE satellite have detected several short-lived gamma-ray flares at energies hundreds of times higher than the nebula's observed X-ray variations. In April, the satellites detected two of the most powerful gamma-ray flares yet recorded. 2. W44:Another interesting supernova remnant detected by Fermi is W44. Thought to be about 20,000 years old — middle-aged for a such a structure — W44 is located 9,800 light-years away in the constellation Aquila. The LAT not only detects this W44, it actually reveals super-energetic gamma-rays coming from places where the remnant's expanding shock wave is known to be interacting with cold, dense gas clouds. Such observations are important in solving a long-standing problem in astrophysics: the origin of cosmic rays. Cosmic rays are particles, primarily protons, that move through space at nearly the speed of light. Magnetic fields deflect the particles as they race across the galaxy, and this interaction scrambles their path and masks their origins. Scientists can't say for sure where the highest-energy cosmic rays come from, but they regard supernova remnants as perhaps their likliest origin. In 1949, the Fermi telescope's namesake, physicist Enrico Fermi, suggested that the highest-energy cosmic rays were accelerated in the magnetic fields of gas clouds. In the decades that followed, astronomers showed that the magnetic fields in the expanding shock wave of a supernova remnant are just about the best location for this process to work. 3. V407 Cygni: V407 Cygni is a so-called symbiotic binary system — one that contains a compact white dwarf and a red giant star that has swollen to about 500 times the size of the sun. V407 Cyni lies about 9,000 light-years away in the constellation Cygnus. The system occasionally flares up when gas from the red giant accumulates on the dwarf's surface and eventually explodes. This event is sometimes called a nova (after a Latin term meaning "new star"). When the system's most recent eruption occurred in March 2010, Fermi's LAT surprised many scientists by detecting the nova as a brilliant source. Scientists didn't expect that this type of outburst had the power to produce high-energy gamma-rays. 4. Pulsar PSR J0101-6422: Pulsars — rapidly rotating neutron stars — constitute about 6 percent of the new catalog. In some cases the LAT can detect gamma-ray pulses directly, but in many cases pulses were first found at radio wavelengths based on suspicions that a faint LAT source might be a pulsar. PSR J0101-6422 is located in the southern constellation of Tucana, its quirky name reflecting its position in the sky. The Parkes study found radio signals from a pulsar rotating at nearly 400 times a second — comparable to the spin of a kitchen blender — at the same position as the unknown Fermi source. With this information, the LAT team was able to discover that PSR J0101-6422 also blinks in gamma-rays at the same incredible rate. 5. 2FGL J0359.5+5410: Fermi scientists don't know what to make of this source, which is located in the constellation Camelopardalis. It resides near the populous midplane of our galaxy, which increases the chance that it's actually an object in the Milky Way. While its gamma-ray spectrum resembles that of a pulsar, pulsations have not been detected, and it isn't associated with a known object at other wavelengths. Fermi's LAT detects high-energy gamma-rays from an extended region around the galaxy that corresponds to the radio-emitting lobes. The radio emission comes from fast-moving particles. When a lower-energy photon collides with one of these particles, the photon receives a kick that boosts its energy into the gamma-ray regime. It's a process that sounds more like billiards than astrophysics, but Fermi's LAT shows that it's happening in Cen A. Our neighboring galaxy, Andromeda, also goes by the names Messier 31 or M31. Here, it is captured in full in this new image by WISE. 2. The Andromeda Galaxy (M31): At a distance of 2.5 million light-years, the Andromeda Galaxy is the nearest spiral galaxy to us, one of similar size and structure as our own Milky Way. Easily visible to the naked eye in a dark sky, it's also a favorite target of sky gazers. The LAT team expected to detect M31 because it's so similar to our own galaxy, which sports a bright band of diffuse emission that creates the most prominent feature in the gamma-ray sky. These gamma-rays are mostly produced when high-energy cosmic rays smash into the gas between stars. "It took two years of LAT observations to detect M31," Jürgen Knödlseder at the Research Institute for Astrophysics and Planetology in Toulouse, France, said in a statement. Currently a visiting scientist at the SLAC National Accelerator Laboratory in California, he worked on the M31 study. "We concluded that the Andromeda Galaxy has fewer cosmic rays than our own Milky Way, probably because M31 forms stars — including those that die as supernovae, which help produce cosmic rays —more slowly than our galaxy," Knödlseder added. Plumes of glowing hydrogen blast from the center of M82, a well known galaxy undergoing a torrent of star formation. This mosaic of six images taken in 2006 by the Hubble Space Telescope is the sharpest ever obtained of the entire galaxy. 3. The Cigar Galaxy (M82): What works for the Andromeda Galaxy works even better for M82, a so-called starburst galaxy that is also a favorite of amateur astronomers. M82 is located 12 million light-years away in the constellation Ursa Major. M82's central region forms young stars at a rate some 10 times higher than the Milky Way does, activity that also guarantees a high rate of supernovae as the most short-lived stars come to explosive ends. Eventually, M82's superpowered star formation will subside as the gas needed to make new stars is consumed, but that may be tens of millions of years in the future. For now, it's a bright source of gamma-rays for Fermi. PKS 0537-286 is a variable blazar in the constellation Leo and the second most distant LAT object. Astronomers have determined that the galaxy lies more than 11.7 billion light-years away. The blazar is the farthest active galaxy in the Fermi catalog to show variability. Astronomers are witnessing changes in the jet powered by this galaxy's supermassive black hole that occurred when the universe was just 2 billion years old (it is now about 13.7 billion years old). 5. 2FGL J1305.0+1152: The last item is another mystery object, one located in the constellation Virgo and high above our galaxy's midplane. It remains faint even after two years of LAT observations. One clue to classifying these objects lies in their gamma-ray spectrum — that is, the relative number of gamma-rays seen at different energies. At some energy, the spectra of many objects display what astronomers call a "spectral break," a greater-than-expected drop-off in the number of gamma-rays seen at increasing energies. If this object were a pulsar, it would show a fast cutoff at higher energies. Many blazars exhibit much more gradual cutoffs. But 2FGL J1305.0+1152 shows no evidence of a spectral break at all, leaving its nature a true mystery — for now, anyway.